11. (7.18.6.G) IF EVENT IS A PARADE, PUBLIC ENTERTAINMENT, RALLY, DEMONSTRATION OR ANY COMBINATION THEREOF, LIST NAMES AND ADDRESSES OF ALL PERSONS WHO WILL BE FEATURED AS ENTERTAINERS OR SPEAKERS: Organizers do not intend to use planned or designated speakers or entertainers. Rather the purpose is to provide an opportunity for those in attendance to speak out and speak with others on the issues of violence in their lives 12. 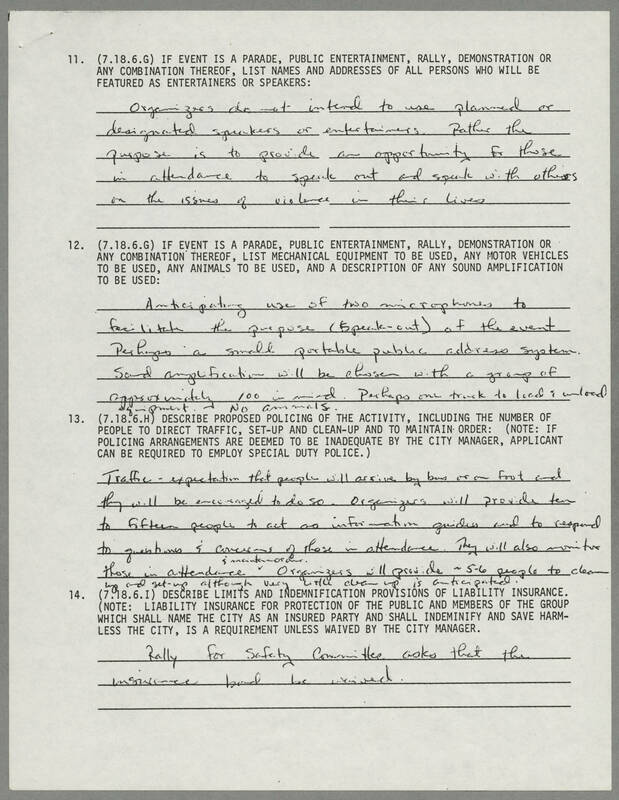 (7.18.6.G) IF EVENT IS A PARADE, PUBLIC ENTERTAINMENT, RALLY, DEMONSTRATION OR ANY COMBINATION THEREOF, LIST MECHANICAL EQUIPMENT TO BE USED, ANY MOTOR VEHICLES TO BE USED, ANY ANIMALS TO BE USED, AND A DESCRIPTION OF ANY SOUND AMPLIFICATION TO BE USED: Anticipating use of two microphones to facilitate the purpose (speak-out) of the event Perhaps a small portable public address system. Sound amplification will be chosen with a group of approximately 100 in mind. Perhaps one truck to load and unload equipment. No animals. 13. (7.18.6.H) DESCRIBE PROPOSED POLICING OF THE ACTIVITY, INCLUDING THE NUMBER OF PEOPLE TO DIRECT TRAFFIC, SET-UP AND CLEAN-UP AND TO MAINTAIN ORDER: (NOTE: IF POLICING ARRANGEMENTS ARE DEEMED TO BE INADEQUATE BY THE CITY MANAGER, APPLICANT CAN BE REQUIRED TO EMPLOY SPECIAL DUTY POLICE.) Traffic-expectation that people will arrive by bus or on foot and they will be encouraged to do so. Organizers will provide ten to fifteen people to act as information guides and to respond to questions & concerns of those in attendance. They will also monitor those in attendance & maintain order. Organizers will provide 5-6 people to clean up and set-up although very little clean up is anticipated. 14. (7.18.6.I) DESCRIBE LIMITS AND INDEMNIFICATION PROVISIONS OF LIABILITY INSURANCE. (NOTE: LIABILITY INSURANCE FOR PROTECTION OF THE PUBLIC AND MEMBERS OF THE GROUP WHICH SHALL NAME THE CITY AS AN INSURED PARTY AND SHALL INDEMNIFY AND SAVE HARMLESS THE CITY, IS A REQUIREMENT UNLESS WAIVED BY THE CITY MANAGER. Rally for Safety Commitee (illegible) that the (insurance?) had be waived.